Drains you see at the side of the road are usually storm drains. Any water or "run-off" that goes down these storm drains usually leads directly to either the ocean or into a river or creek. Water that goes into a storm drain is not cleaned or treated. 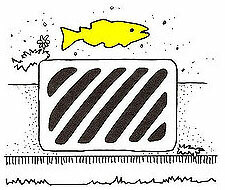 You may have seen fish painted beside these storm drains - that is an indication that there are habitats at the other end of the pipe that will be affected by what washes down there. Never pour waste or throw garbage directly into the storm drain - for example, a bucket where you have been washing your paint brush, excess motor oil or soaps from washing your car should not be disposed of down a storm drain. After a downpour, anything that has been sitting on the ground surface gets picked up by the rainwater and is spread across the landscape. It could be an oil slick on your driveway or pesticides sprayed on your lawn. Those substances pollute the run-off that ends up in the storm drains and then in our waterways. More permeable surfaces (where water can sink in) on your property mean less water "runs-off" into the storm drain; more water is filtered through the soil to refill the groundwater. Permeable surfaces like gravel and soil act as a sponge and prevent 'flash floods' when it rains.